Taco Tuesday is basically a holiday in our life. 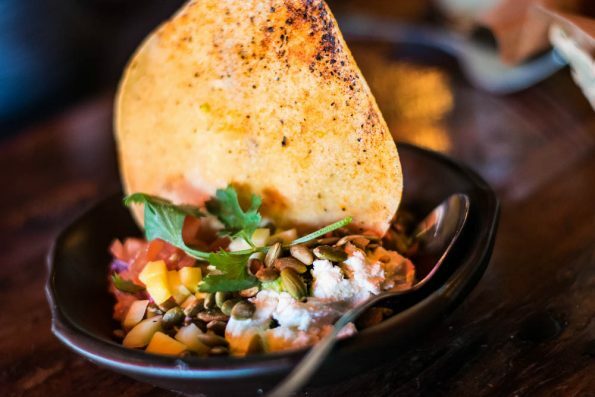 When we were offered the opportunity to try out the Baja California inspired cuisine at Sol Cocina we asked ourselves what we wanted to focus on. Standard tacos are great, but we wanted to share the taco love with everyone, including vegans and vegetarians. We decided to keep our meal to completely vegetarian options that could be turned into vegan options without loss of flavor. With our goal in mind, we set forth on our vegetarian journey for tacos. We started our meal at Sol Cocina with a couple margaritas, chips, salsa (chipotle and black bean), and the Guacamole Sol. The Guacamole Sol is their naked guacamole served with mango, tequila, creamy goat cheese, toasted pepitas and cilantro (omission of goat cheese makes this vegan friendly). This was a great way to start our meal! The creaminess of the goat cheese played well with the guacamole and mangoes. It made for a rich flavor that was further enhanced by the crunchiness of the pepitas. Each bite was a different experience. Spice-Roasted Butternut Squash Taco- on corn tortilla with melted cheese, green chile salsa, smoky red pepper salsa and crispy fried onions. We were not disappointed by any of these tacos! The Corn, Poblano, and Mushroom taco was the vegetarian taco for meat lovers. It had not only good heat, but it was also full of complex flavor. The mushrooms themselves were the most flavorful part. The next tacos we tried were the Sweet Potato and Black Bean tacos. While talking with one of the managers, we learned that these tacos were actually created for Oprah and featured in her magazine. 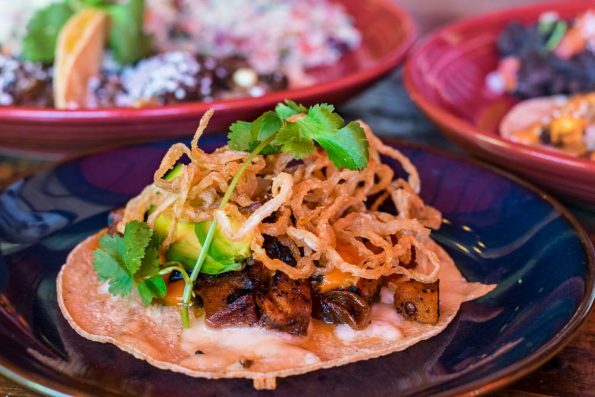 While a familiar vegetarian taco, Sol Cocina’s version is just flat out better. The last taco we tried was the Spice-Roasted Butternut Squash taco. If you like heat, this taco is for you! The pieces of avocado add extra creaminess and tone down the heat without sacrificing flavor. All of the tacos can be made vegan with the omission on cheese and the chipotle sauce on the sweet potato taco. The taco plates are served with your choice of 2 sides. The sides are: Quinoa Salad, Borracho Black Beans, Red Rice, and Spicy Slaw. All of the sides are vegetarian friendly and only the cole slaw is not vegan friendly. 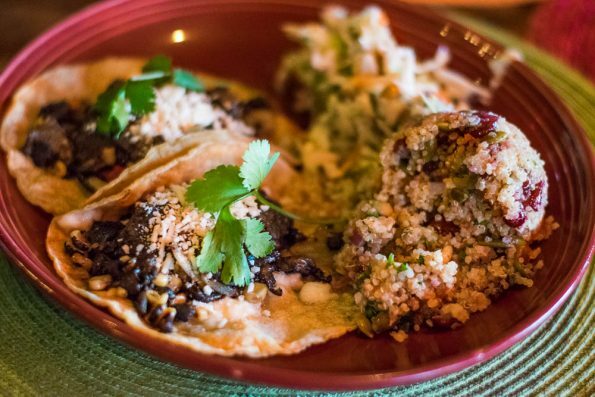 The acidity of the Quinoa Salad and Spicy Slaw cuts the richness of the tacos well and are both very flavorful (especially the Quinoa Salad). 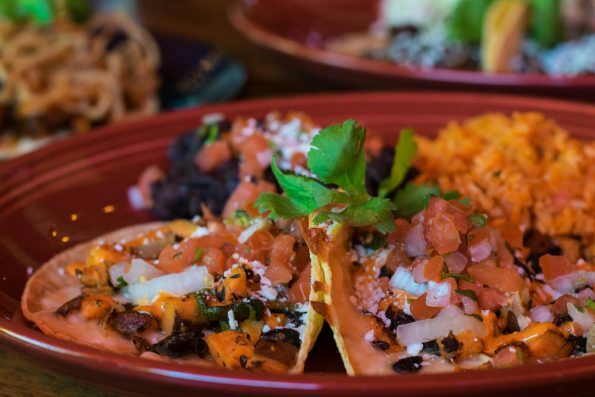 The Borracho Black Beans and Red Rice are the perfect representations of what you’d expect from a rice and beans side. Surprisingly flavorful without the use of lard or chicken stock, both won’t disappoint. We really enjoyed our dinner at Sol Cocina. Tacos seem like such an easy thing to do, but after over two years of never missing a Taco Tuesday, finding a taco (or even three for that matter) that is out of the box, full of flavor, and not something we have had before is a rarity. 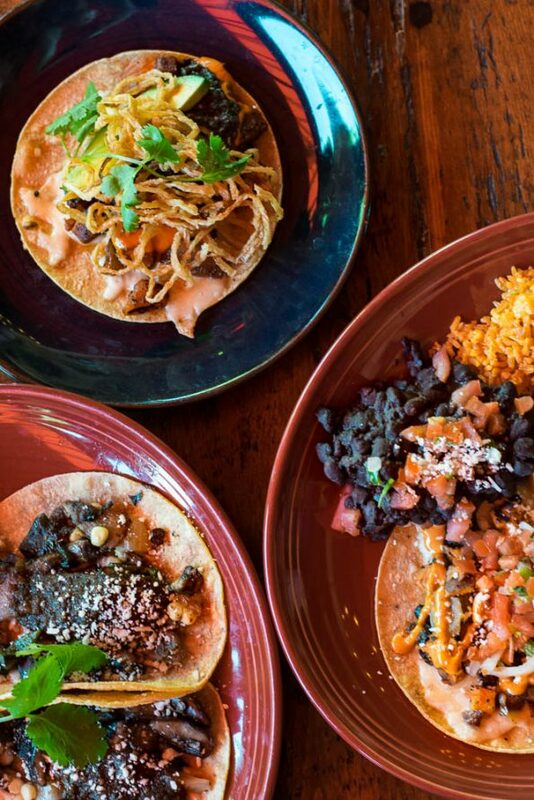 Live music, great food, and specials make Sol Cocina a must visit spot for Taco Tuesday! Trust us, we know tacos!